For the AFM measurements in the article “Direct observation of the dynamics of single metal ions at the interface with solids in aqueous solutions” by Ricci, M. et al. a NanoWorld Arrow-UHFAuD AFM probe was used. Congratulations to the authors! Figure 3 from: “Ricci, M. et al. Direct observation of the dynamics of single metal ions at the interface with solids in aqueous solutions.“: Kinetic experiments conducted in pure water (a) show mainly two levels (arrows) when compared to Fig. 2a. Height variations are less pronounced than in RbCl solution and analysis of the surface dynamics (inset) reveals slower timescales with a relatively strong dependence on the choice of threshold. The profile shown in the inset is taken after site averaging (see e.g. Fig. 2d), hence the small height variations. More reliable results were obtained for lower threshold values (here −20 pm, see Supplementary Fig. S10). 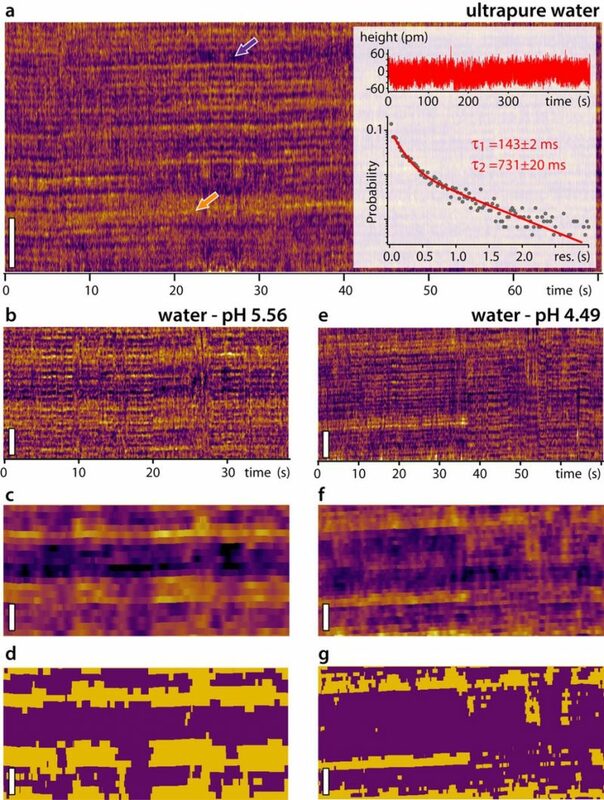 The overall ratio between the two levels visible in (a) can be changed by adjusting the pH of the water with HCl (b–g), suggesting the higher level to be related to hydration water and the lower level to reflect adsorption of H3O+, as detected by the AFM tip. For each of the pH value studied, the raw kinetic experiments (b,e) are site-averaged (c,f) as in Fig. 2d to remove the mica corrugation and imaging noise. The height distribution of the site-averaged data is then binarised automatically (d,g) depending on whether the surface height is higher or lower than the average between the surface’s highest and lowest points. The fraction of surface interpreted as covered with H3O+ (purple in d and g) changes from 55 ± 3% to 75 ± 2%. (b,e) were acquired with a same tip. The mica samples have been rinsed with the imaging solution after being cleaved and the presence of K+ ions on the surface can be neglected (concentration <10 nM). The scale bar is 3 nm in all experiments. The dynamics of ions adsorbed at the surface of immersed charged solids plays a central role in countless natural and industrial processes such as crystal growth, heterogeneous catalysis, electrochemistry, or biological function. Electrokinetic measurements typically distinguish between a so-called Stern layer of ions and water molecules directly adsorbed on to the solid’s surface, and a diffuse layer of ions further away from the surface. Dynamics within the Stern layer remain poorly understood, largely owing to a lack of in-situ atomic-level insights. Here we follow the dynamics of single Rb+ and H3O+ ions at the surface of mica in water using high-resolution atomic force microscopy with 25 ms resolution. Our results suggest that single hydrated Rb+ions reside τ1 = 104 ± 5 ms at a given location, but this is dependent on the hydration state of the surface which evolves on a slower timescale of τ2 = 610 ± 30 ms depending on H3O+ adsorption. Increasing the liquid’s temperature from 5 °C to 65 °C predictably decreases the apparent glassiness of the interfacial water, but no clear effect on the ions’ dynamics was observed, indicating a diffusion-dominated process. These timescales are remarkably slow for individual monovalent ions and could have important implications for interfacial processes in electrolytes.